Exercise stress testing began in the 1920s as researchers noticed changes in the ECG readings of patients suffering from angina. Over time and after thousands of examinations, clinicians were able to equate certain ECG waveform shapes and testing parameters (heart rate, blood pressure, exertion effort, and time) to abnormalities and pathologies. Today, the value of exercise stress testing for the prognostic assessment of patients is well accepted (Gibbons et al., 2002). In general terms, exercise stress testing is used to gauge how well the heart works when it has to pump harder and use more oxygen. As a patient walks on a treadmill or rides a stationary bike, exercise intensity is increased in order to mimic the strain placed on the heart when arteries are blocked or narrowed. Perhaps the most widely used testing methodology is the Bruce protocol (Hill and Timmis, 2002). It has seven stages, each lasting three minutes. After taking ECG and blood pressure measurements with the patient at rest, Stage 1 begins with the patient walking at 1.7 mph (2.7 km) up a 10% incline. At this pace, the energy expended is about 4.8 times that of the patient at rest or 4.8 metabolic equivalents (METs). The objective of the test is for each patient to achieve their maximum predicted heart rate - calculated as 220 minus the patient's age (or 210 minus the patient's age for women) - without exhibiting abnormal ECG segments, chest pain, ataxia, dizziness, or severe fatigue. Attainment of the predicted maximum heart rate is considered a good prognostic sign. After the exercise has stopped, testing results continue for up to 15 minutes. ECG changes during recovery carry the same significance as those occurring during exercise. A normal test result is one in which 85% of the maximum predicted heart rate is obtained with a normal response in blood pressure and with no abnormal ECG segment changes. During the exercise stress test, blood pressure is measured at the end of each stage. Systolic blood pressure typically rises as exercise intensifies. A level up to 225mmHg is considered normal in young adults. Diastolic blood pressure tends to fall slightly. Exercise stress tests are usually stopped if the systolic blood pressure falls by more than 20mmHg or approaches 300mmHg. A rise in diastolic blood pressure over 110 mmHg invokes caution and higher diastolic results approaching 130 mmHg are an indicator for terminating the test. Patients who reach a stage 3 of a Bruce protocol with a rise in systolic blood pressure of >30 mmHg from the onset of exercise have an annual mortality of less than 2% and are considered low risk for developing cardiovascular disease (CVD). Alternatively, patients with low exercise capacity and hypotension (low blood pressure) induced by exercise have a poor prognosis. Reliable blood pressure measurement during exercise stress testing is essential to making an accurate diagnosis (Singh et al., 1999; Kurl et al., 2001; Fossum et al., 1998). Systolic blood pressure (SBP) during exercise has been found to predict hypertension (Allison et al., 1999), coronary heart disease (McHam et al., 1999), stroke (Kurl et al., 2001) and cardiovascular disease (CVD) death (Mundal et al., 1996). Previous studies show that excessive elevated SBP during exercise testing is a stronger predictor of mortality due to CVD than SBP at rest (Kjeldsen et al., 1997). Unfortunately, accurate blood pressure it is not so easy to obtain. The limitations of measuring blood pressure during exercise stress testing are well described in Stress Testing, Principles and Practice by Myrvin H. Ellestad (Oxford University Press, 2003; p335 - p338). Ellestad found that simple hearing differences and observer bias among individuals led to "significant intra- and inter – observer variability" even when the common sources of blood pressure measurement error (inaccurate manometers, inappropriate sized cuffs, too rapid deflation rates, and training issues) were eliminated. These issues can be further confounded by the noise of the patient on a treadmill. One can imagine the difficulty of taking a manual blood pressure measurement by listening for Korotkoff sounds (K-sounds) with a stethoscope under these conditions. Fortunately, there is a product available today that takes the variability out of blood pressure measurement. The SunTech Medical Tango+ automated monitor for exercise stress testing accurately and reliably captures blood pressure measurements in high noise and patient motion conditions. It does so by utilising the R-wave segment of the ECG signal to "gate" the interval for detecting the K-sounds via a special microphone tuned to K-sound frequencies. 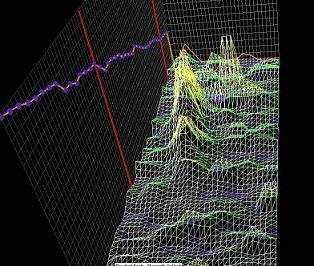 Upon stacking the detected sounds into a 3-dimensional map, proprietary algorithms search out the "peaks" to determine the Korotkoff phases that equate to systolic and diastolic blood pressures. The SunTech Medical Tango+ automated blood pressure monitor for exercise stress testing "provides reliable automated BP (measurements) within an acceptable clinical range" (Cameron et al., 2004). It is a major advance in acquiring reliable blood pressure readings of patients undergoing exercise stress testing – enabling more accurate patient assessment and more complete differential diagnosis.